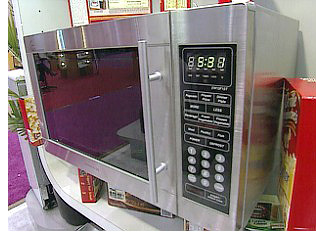 Daewoo Voice Recognition Microwave – The Lazy Get Lazier | OhGizmo! By Andrew Liszewski on 09/26/06 • Leave a comment! To those who shudder when they think about all the work needed to cook a meal in an oven the microwave probably seems like the greatest innovation of all time. However there are those persons who feel that having to type in a few numbers and hitting the start button is still too much work which is why Daewoo is coming out with a voice-activated version. The microwave will store up to 40 different voice commands and will be able to respond to anyone talking to it, not just the person who programmed it. Basically you tell it what you’re cooking and the oven will automatically set the correct time and temperature for your food. Daewoo claims this microwave is nearly 95% accurate too meaning you’ll want to keep a fire extinguisher handy for the 5% of the time when it turns that potato into a lump of smoldering coal. The Daewoo Voice Recognition Microwave should be available sometime in 2007.